These middle-of the road models offer few surprises, but a $430 version of this 13-inch laptop will get an Intel Core i3. Toshiba is making some modest improvements to its Chromebook 2 laptops, adding 5th-generation Intel processors and backlit keyboards. Unfortunately, Toshiba hasn’t followed Google’s lead in adding USB-C support to its Chromebook, instead opting for one USB 2.0 port, and another USB 3.0 port. While it’s still early days for USB-C, the number of USB-C peripherals is growing, and it’s nice being able to charge, connect accessories, and power an external monitor all from a single cable. 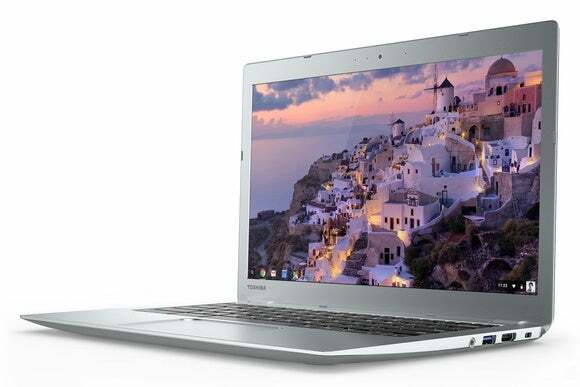 Toshiba will start selling both of the new Chromebook 2 laptops in October. Why this matters: While some other Chromebooks are getting much bigger screens, convertible touch displays, and unbelievably low prices, Toshiba is playing it safe with its new browser-based laptops. It’s not too big, not too small, and lacking in gimmicks, so it could be just the right fit for accessing the web through Google’s Chrome browser.